Butaotome (meaning "Pig Girl", stylized as "BUTAOTOME") is a doujin music circle. It was founded in Autumn 2009 by four drinking buddies who "wanted to do something fun". They started uploading stuff on niconico in November — first cover songs, then their own Touhou arrangements. They published their first album, Touhou Kaiten Mokuba, in March 2010. Since then, they've participated in every Comiket and Reitaisai and brought at least one new release each time. Their main type of work is vocal Touhou arrangements characterized by the J-pop/rock sound provided by Comp, Ranko's powerful vocals and Paprika's piano, but they also like to experiment. Ranko's older sister, Ranko no Ane, is the circle's designer. For most albums, the four members create and produce everything. Paprika releases the Touhou Nekokenban albums. The series debuted in August 2010 and has received two releases per year — one each Comiket — ever since. They were pure piano albums with instrumental renditions of Butaotomes vocal songs at first, but became more experimental as the series went on. The circle also releases original albums and songs, which tend to keep their "standard" sound. Their first five original albums were doujinshi. They released their first commercial album, Furubokko, under Avex Trax in March 2017. 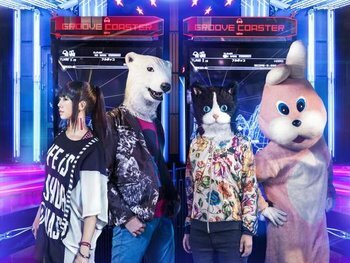 Some of their songs have appeared in Rhythm Games like maimai, CHUNITHM, Sound Voltex, Groove Coaster and jubeat. They've released too many albums to list them all here, but the English fansite Tiramisu Cowboy features a complete discography as well as plenty of in-depth information. Amazing Technicolor Wildlife: Ranko no Ane's persona is a pink rabbit. Audience Participation Song: Ranko always lets the crowd sing the part before the final refrain of "Machibito wa Kozu". Concept Album: Every Touhou album has a specific motif related to the selected Touhou themes, or simply for the music style. Everyone Calls Him "Barkeep": The Stage Name of Ranko's older sister is simply "Ranko no Ane" — "Ranko's Older Sister". While it's not surprising that Ranko calls her "ane" and "oneechan", everyone else refers to her as "oneesan" (or something equivalent). Funny Animal: With the exception of Ranko, every member has an anthropomorphic animal persona: Paprika is a cat, Comp is a polar bear and Ranko no Ane is a pink rabbit. The Buta BEST series consists of three greatest-hits albums featuring vocal Touhou arrangements. Omatome is a collection of their guest tracks. Touhou Nekokenban THE BEST is a best-of album from the Nekokenban series. Touhou OtoGee BEST is a best-of album featuring Butaotome songs from Rhythm Games. Yuusei Hakurankai features a selection of their Hifuu songs. Long Title: The album Jitsu wa Sensai na Anata to tama ni Yuukan na Watashi no nandaka Sawaideru tte Hanashi. Non-Indicative Name: The circle's name means "pig girl". While three of its four members have Funny Animal personas, there's no pig girl. The Touhou Nekokenban series just numbers its numerous entries. The limited singles in the Music Room trilogy were numbered Vol.1 to Vol.3. The limited Utau Acoustic series made it to Utau Acoustic Vol.12. Ayakashi Yokochou has "Koi no Yamai (Rojiura ver)" and "Utakata (Rojiura ver)". CHILD HOOD'S END features a "Aoi Miren, Aoi Namida (chillax ver)". Daihinmin has "Nai. (Daihinmin ver.)". Their Touhou albums are all about rearranging Touhou music and possibly adding lyrics. The album Guerilla consists of eight remixes of previously released Butaotome songs. Ranko got her Stage Name from a Totsugeki! Pappara-tai character. The cover of Touhou Nekokenban 5 makes it resemble a PSP game. The cover of Touhou Nekokenban 10 look suspiciously like something out of Ratatouille. In the PV for "Aoi Miren, Aoi Namida", Cirno plays games that are clearly based on Super Mario World, Mega Man and Balloon Fight, among others. The video itself pays homage to several IOSYS PVs like "Cirno's Perfect Math Class" and "Marisa Stole the Precious Thing". Stage Names: Every member of the circle has a stage name. Ranko is named after a Totsugeki! Pappara-tai character. Ranko no Ane is Ranko's older sister. Comp's name comes from "compressor" because he loves it. The origin of Paprika's stage name is unknown, but she doesn't like paprika. sachlich has three songs with vocals by Ranko no Ane. I LOVE RED and I LOVE CHERRY have vocals by Comp and Paprika. Most of the songs on Pop are about youkai eating humans. The Shoujo Rengoku series has art based on illustrated night parades and Ukiyo-e style. Title Track: Furubokko and Trauma Recorder feature one. Trrrilling Rrrs: Ranko used to roll her R's frequently, but has toned it down a lot after the release of Getsumen Tansa in December 2015. She still does it occasionally. With Lyrics: Most of their songs are vocals arrangements of instrumental Touhou music. Work Info Title: The title Touhou Nekokenban series means "Touhou Keyboard Cat". Guess what instrument it focuses on.